For many Chicagoans, it seems like this election cycle is never ending. The Illinois midterm elections happened in November, followed by the Chicago municipal election on Feb. 26. Now there’s a Chicago runoff election on April 2 and a presidential election in November 2020. Whew! Although the race to oust President Donald Trump is dominating the national political conversation right now, there’s something historic brewing right here in Chicago’s own backyard. For the first time ever, a Black woman is going to be the mayor of Chicago. With early voting for the Chicago runoff beginning today (Friday, March 15), voters will have between now and April 2 to decide whether that Black woman will be former Chicago Police Board president Lori Lightfoot or Cook County Board president Toni Preckwinkle. 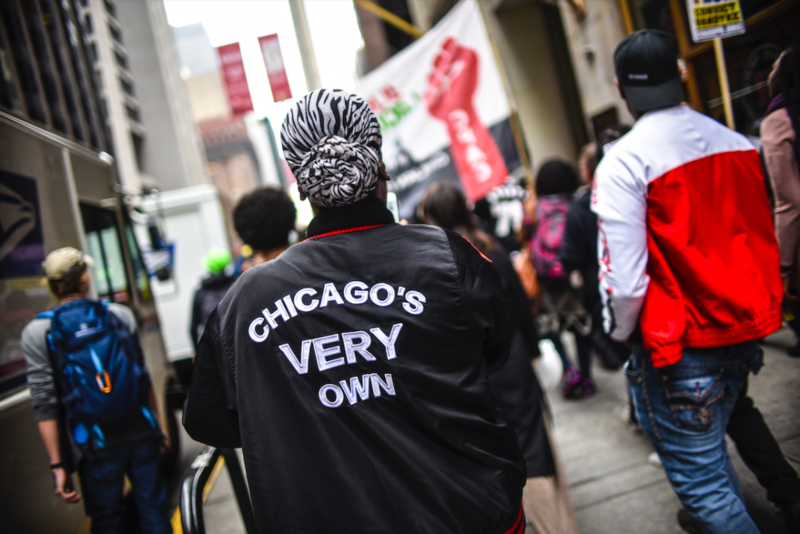 There’s a lot going on in Chicago right now, especially for Black and Brown residents. Earlier this week in City Hall, outgoing Mayor Rahm Emanuel bulldozed through several controversial big-ticket items, including plans to build a $95-million police and fire academy in West Garfield Park. In a 38-8 vote, City Council approved an $85-million AECOM contract to build the facility, according to the Chicago Reporter. City Council also agreed on a $65 million bond issuance to fund the academy’s construction. Hundreds of Black and Brown organizers from grassroots organizations such as No Cop Academy, Assata’s Daughters and GoodKids MadCity spent hours in City Hall protesting the academy. 37th Ward Alderwoman Emma Mitts addressed the organizers during Wednesday’s vote. Mitts: "I hear the activists. But when you have nothing, you have to get something done." The academy will make our neighborhoods better, Mitts says. Notes that she met with Lightfoot & Preckwinkle this weekend: "They are not as opposed as the media makes it seem." 20th Ward Alderman Willie Cochran didn’t show up. Though 5th Ward Alderwoman Leslie Hairston voted in favor of the academy in the past, she was the only member of Chicago’s Black Caucus to vote against it at Wednesday’s meeting. She’s facing activist Willie Calloway in the April 2 runoff race for her 5th Ward aldermanic seat. Take a look at every city office in the runoff election. Here’s a look at when, where and how to vote in the April 2 runoff. All registered voters can vote by mail. The Chicago Board of Election suggests applying to vote by mail between March 5 and March 20 to allow enough time to receive and mail your ballot by April 2. Click here to learn more about how to vote by mail. Early voting for the April 2 runoff begins on March 15 at the Loop Super Site, located at 175 W. Washington. From March 18 through April 1, there will be more early-voting and voter registration locations open throughout Chicago. Click here to learn more about early voting. The runoff election is on Tuesday, April 2. According to the Chicago Board of Election, a government-issued photo ID is not required to vote, but it’s helpful in case questions arise about your registration, address or signature. To find your ward, and polling location, click here.